What a fantastic start to the year. Joe and Lewis from Liverpool and Amber from Australia have been helping me clear the trails. They’ve been excellent company too. After dinner, we’ve been out dancing until the early hours several times and on the full moon we drove up to Palouki, made a fire and had our dinner there. 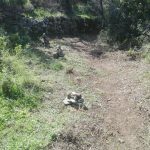 We’ve also been working hard on the Palouki trail, making it passable for mountain bikers as well as hikers. What a fantastic year it’s been. Starting on 13 March with Sam and Monique from Canada, we had a total of 19 Workaway volunteers and 9 tourist volunteers who donated days of their holiday. 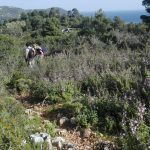 Trails cleared: Potami to Diakopi, Kokala, Tzukala (Monks trail), Tzelali, Kimissia, Retsina trail (Pirgos area), Panormos and Moutero, Vromeneri/Potami and behind Episkopi. Emmanuel also removed one huge tree at Kimissia, another at Pirgos plus two enormous ones at Ag Iannis Skleri. He’s my chainsaw hero; brave and tenacious. Sam and Monique (Canada), David (Spain), Jenna (US), Liesa (Germany) Steve (UK), Eleni (US), Nikos (Canada), Che (Scotland), Hannah (Wales), Alexa (US), Jennie (Germany), Leigh (Australia), Gloria (Majorca), Rory (Ireland), Allie (Canada), Polly and Austin (Australia) and Audrey (Singapore). Tourists: Jackie and Dee, Anita, Felix, Bankje, Pamela, Dan, Clive and Amy plus locals Dimitri Palaeologos and Emmanuel Palaeologos. A huge thanks to them all. Maintenance is being carried out and we’ve just completed the portion that runs between Diakopi and Pirgos (near Anania). 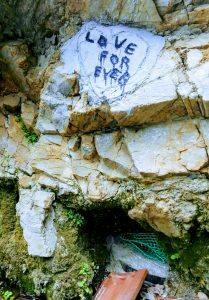 For those of you who think they know Skopelos, this is an area you may not have stumbled across. 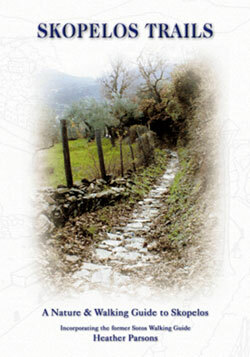 I remember it as being a small footpath beside a narrow brook that lead to the spring of Lalaria. I couldn’t believe the change due to the floods of 3 years ago. Now we have a wide canyon, forged by the water pouring down from Palouki. The Spring has gone. 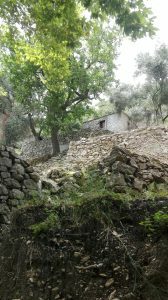 We are left with beautiful plane trees lining a dry (at the moment) river bed, which ends at a sheer rock face with a natural spring, the waters of which are being harnessed by someone to supply water to their nearby vegetable garden. 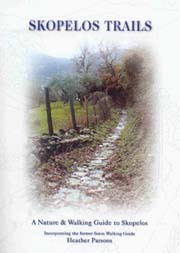 This route can be used to get further up the Old Stafilos Road. See my sketch map page 19 of the guide book and page 21, image 4. 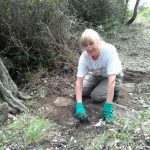 Skopelos Trails is now an official non-profit organisation. We are in the process of opening a bank account should you wish to make a donation. We have also made our first official complaint to the council regarding fenced areas on the trails. They are obliged to look into the matter and discuss at the next council meeting. In the meantime, no response to my request to take one of the council rooms on the port; offered several years ago when I wasn’t able to accept due to lack of support (which I now have). 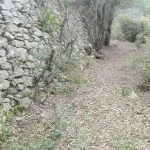 We are still working a few hours a day at Kimissia, trying to create an extreme cycle route which will also help the walker as it entails widening the trail in general. Since introducing the Map App, several people have asked ‘Why only android? Why not Apple? Well, I didn’t know, so I asked the app developer and this is his answer. In order to develop for Apple, you have to pay royalties. For android, there are no costs. Also I don’t personally have an Apple laptop. If you have an Apple application, it can’t be free. When writing about blocked trails, it’s usually regarding a mean land owner but this time, we are the culprits!! 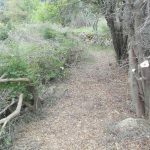 Whilst trying to cut down and remove a tree and use it as a bridge in the remma on the Kimissia trail, everything went a bit wrong. So for the moment, the trail is blocked although it is possible to crawl under the foliage. We’ll get back there asap. A very big THANK YOU to Tam Nightingale for inviting us to his home and for cooking a fantastic meal and to Eva Karras for providing us with a huge pasta meal. 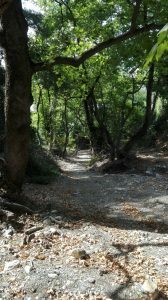 Generous gestures of this nature mean a lot to Skopelos Trails and we do not take them for granted. To have this support from non walkers is humbling and saves me from preparing and cooking for the volunteers after a hard day on the trail, so much appreciated on a person level. If you’d like to donate a meal, please contact me. We’ve been working very hard with maintenance work but over the last three days have actually reopened a portion of calderimi that has been closed for at least 35 years. I’ve walked by it many times but only recently got to thinking that this portion of the trail just didn’t make sense. So, I started sniffing around and in fact one of my volunteers discovered a wide, cobbled (calderimi) in the bushes. This year I was able to get it reopened. It’s behind the Tzukala spring, Glysteri. The reason it was detoured is because a portion of the supporting wall had collapsed. For hikers this is no problem but I guess if you had a mule it would be more problematical. Please welcome David from Spain and Jenna from the USA. We’ve been working for several days now, joined on Saturday by local Emmanuel Paleologos, on the trail between the heliport and Prof. Ilias, Kokola. Please be careful at a small holding near the water tank at the Prof. Ilias end as there are some free and rather aggressive dogs.